Spring is finally here, which means that Easter is right around the corner. 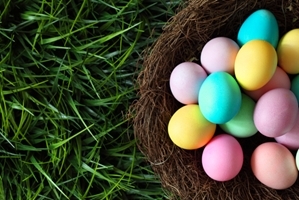 If you're looking for fun and creative ways to celebrate this seasonal holiday with your little ones, there are numerous ways you can blend Easter traditions with the thrill of being able to enjoy the warmer weather outdoors. Here are a couple of holiday activities that you and your kids are sure to love. Colorful eggs are a big part of modern Easter celebrations, so consider making a homemade batch with your children. With a dozen hard-boiled eggs and a variety of vibrant egg dyes, your children can dip and paint on colors to create festive holiday patterns. Easter egg color favorites include light green, yellow, pink, purple and light blue. Letting the eggs dry outside in the sun will ensure that they're finished quickly. Once you've finished your eggs, consider hiding them around your backyard or a local park and hosting an Easter egg hunt. Let your kids run free to try to find as many eggs as possible to determine the winner. You can also use hollow plastic eggs, which you can stuff with small goodies like coins, chocolates and small toys.